As springlike warmth begins, so does spring allergy season, triggering symptoms for allergy sufferers. 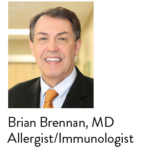 Board certified Allergist/Immunologist Dr. Brennan can help identify the causes. Allergists/Immunologists are highly qualified to manage immune system disorders such as allergies, asthma, inherited immunodeficiency diseases, and autoimmune diseases.